JAYCO LED Light, you can call it LED T10 bulb or LED wedge bulb , is a economical choice to take place of traditional halogen, which supply multipurpose ,including cabinet down, caravan, motor homes in the condition of 12 volt. Counting on the creative product, you can reach out for brightness at ease, no matter in exterior and interior environment. 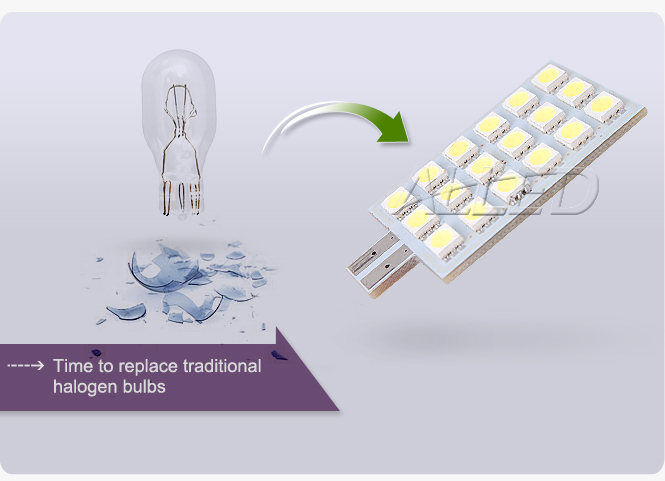 As the name called, the LED wedge bulbhas a specialized socket with wedge shape matched, and the installation of the well-design wedge socket could never be a headache, with the appropriate wiring connection, bright white light draw minimal current and definitely be cool. The operating voltage is set in 13.5v, when the lightness level of the two lighting generations reach 200 lumens, LED T10 bulb cost 190mA while the power consumption of halogen is up to 1500mA, their power consumption rate could stretch to 1:8, that is to say, compared with one halogen light bulb, the led wedge bulb has eight times continuous lighting with the identical power consumption. Obviously, the JAYCO LED light gains the complete victory in the use efficiency, which reduces lens distortion. By the way, compared to the halogen light, the new generation has no filament to break, and more durable owning long life span to 50,000 hours. Obviously,we can recognize that it is an era for the led, according to the comparison between two lighting bulbs.You can choose JAYCO LED light or other brands. We are not recommending one brand over one brand, but to make sure that we are doing something meaningful to improving your quality life. Thanks to take your attention to the LED wedge light.